Growing the beard and mustache mean you have to shape and take care of it regularly. Otherwise, they will betray you, it will not make you look more masculine and attractive but will make you look messier. To deal with these problems, it is vital to find out the best mustache scissors. Today, I will make a short review on the best ones which I used before. The first mustache scissors that I want to introduce to all of you is the Striking Viking kit. I want to talk about this kit first because of its performance. There are three factors that I pay more attention to when I choose a mustache scissors, including the size, quality and ease of grip. These scissors come with a mini comb and a leather case. You can take the use of this mini comb to trim your mustache and the leather case to put them in, when travelling. The Striking Viking scissors have a perfect size with 4.5 inches. This suitable size helps you to remove the straggling hair easily. You can use these scissors for both your beard and mustache. The unruly beard can make you look imperfect, so you will need these shears to eliminate them. The blades of these scissors can cut your mustache evenly and smoothly throughout the placed fulcrum. The Striking Viking shears are made from the high carbon steel which is durable. This material contributes to create a sharp, sleek and smooth blade. 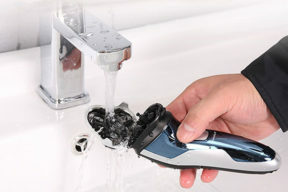 It provides a precise trimming to leave you a neat mustache and beard. 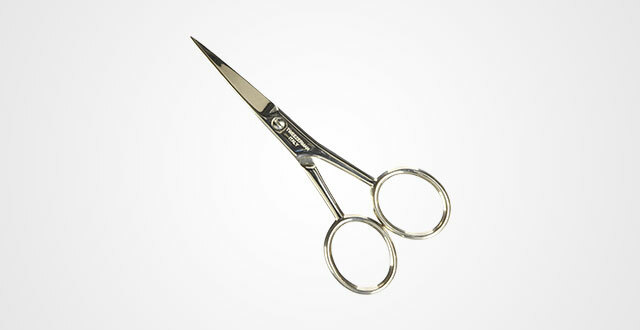 These shears are perfect for me, but I think that they are not suitable for those who have a thicker beard than normal. If you have a very thick beard, then you should consider carefully because it may not complete the detail work at the first use. The next impressive mustache scissors are the mustache and beard grooming scissors. These scissors have a great performance and they do not cause any negative effects on my skin. These scissors are multifunctional that can trim all small parts such as nose hair, moustache, or ear hair accurately. They have rounded tips, so they will not harm the most sensitive areas as ears or nose. The blades are sharp to ensure quick trimming. Furthermore, the handles are round that can bring you the comfort when using. These handles fit most users who have small or big fingers. The length of these shears is 4 inches. The mustache and beard grooming scissors are made from the stainless steel which is one of the most durable, and low maintenance material. This kind of material is the least expensive choice in the life cycle cost, compared to others. Overall, many people prefer these scissors because their material is durable and have high precision. Besides, they are multi-purpose as well as travel friendly. They have comfortable and easy grip. If you intend to buy these scissors, you should choose carefully because some shears have blades too far apart to cut. But just a small number on the market, in case you are unlucky. If you are a starter, and worried about how to shape your mustache and beard, here is a great solution for you. 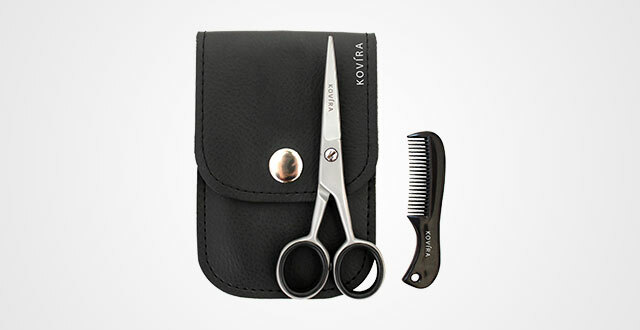 These scissors come with a symmetry comb that is very helpful for you to style. 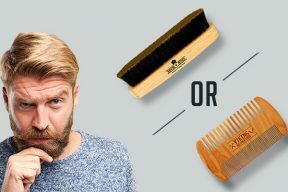 Both scissors and comb are amazing tools for shaping or trimming your beard. The comb is very convenient which can be used for mustache, jaw, sideburns, cheeks, neck and goatee lines. The scissors are really sharp that help you cut accurately and smoothly. The dimensions of these scissors are 5.1 x 5.1 x 0.1 inches. The blades are thin and super sharp. The scissors are very good for trimming mustache and nose hair. This kit was made from the high carbon stainless steel. This material made it sharper than other materials. Indeed, blades’ scissors used stainless steel are not as sharp as high carbon steel. Because of the durability of this set, you can use them for a long time and they do not rust, stain or chip easily. The Kaiercat stainless steel beard shaping tool and scissors are perfect for bearded men; however, the handles of the scissors are quite small and if you have big fingers, it won’t fit your thumb. This set is highly recommended for medium sized beards. To be honest, there is nothing better than finding out the right tool for trimming the mustache because sometimes, you see the best scissors for beards, but they are too big, so you cannot use for your mustache. However, these scissors are the best one and they can be used for all types of beard hair. They are 5 inches long and come with a small comb. The same as the above ones, these scissors are made from the stainless steel. 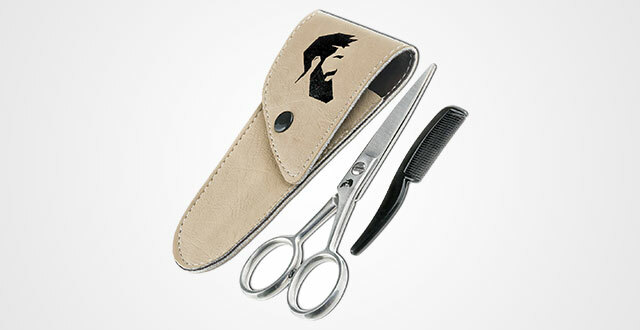 The scissors are designed to help you have a precise cutting of the sideburns, beard or mustache. You can manage your facial hairs in the way you want. Specially, they have sharp razor convex edge blades that provide you accurate cuts. 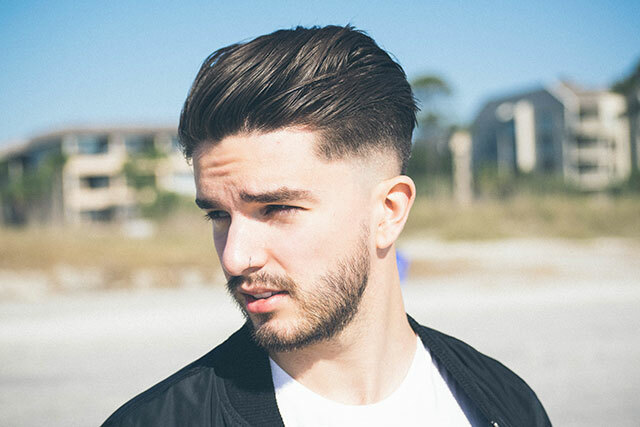 The sharp blades will keep you look awesome and stop worrying about unruly or stray beard. 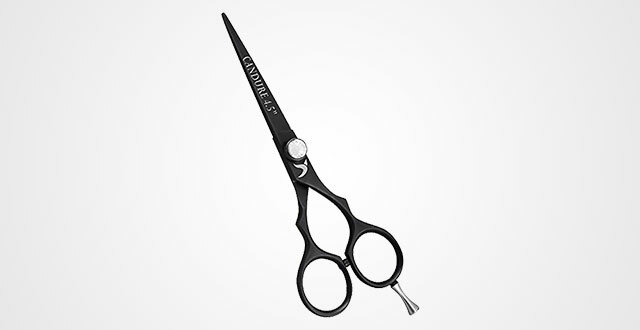 These scissors are suitable for all types of thin or thick hair, heavy or light hair. Furthermore, they are definitely useful for curly hairs and thick coarse. These small sharp scissors are extremely versatile. You can use them with any fingers you want with the tension adjustment to fit yourself. These scissors are high quality, sharp and durable. They are perfect for mustache trimming. The scissors are pretty sharp, so be careful when using with your nose hairs. It can hurt or pull your hair when you are trying to cut them. With the regardless of this point, these scissors are well-made and worthy to invest. The same as the Sunorva scissors, these scissors also have a tension adjustment to fit all sizes of fingers; however, the Sanguine professional mustache and beard trimming scissors look more attractive. You can handle it by both your right and left hands. These steel scissors are small enough to use on beard, mustache and eyebrows. They are extremely sharp to provide you a perfect tool for cutting and shaping your beards. The blunt tips will not hurt your sensitive skin. They make a quick work to stop the unruly beard hairs. They do a commendable job for trimming the mustache line with a great care. The Saguine professional mustache and beard scissors are easy to use both sides of the face and get into the tightest spots. Their dimensions are 5 x 2 x 0.2 inches. With these dimensions, you can use it more flexibly like a barber. These scissors are made from Japanese steel which is famous for the durability. These scissors can inspire you to become a barber for yourself. Furthermore, it helps you to deal with beard issues immediately without going out. 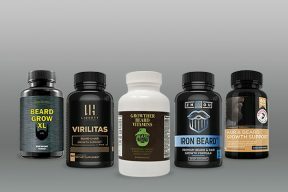 Your beard will look more attractive and masculine. Although these scissors seem to be the best mustache scissors, they cannot do the detail works well because its tips are not sharp enough. If you just want to have shears to trim the whispers, these scissors are fine. The next scissors for mustaches is Effenfine nose hair scissors. The first thing that I want to mention here is its performance. I think they work well with all kinds of work. These scissors are designed for nose hair trimming mainly; therefore, their tips are made carefully to avoid hurting your sensitive skin inside. The rounded tips are safe for cutting delicate areas. Apart from trimming the nose hair, you also can take the advantage of these scissors for your mustache and beard. The blades are sharp with 2.5 inches in length to produce a precise trimming. The beard will be cut neatly and smoothly. The grip is designed for both right hand and left hand. It has large finger rings to give you the most comfortable control. If you have big or small hands, you do not need to worry because it fits all sizes. These scissors are made from Japanese stainless steel which is extremely delicate. They have a curved cutting edge to let the users have more precise cut. These scissors have a good quality and performance, but their blade tips are pretty wide to trim the nose hairs comfortably. I always appreciate scissors that can be used both right and left-handed people because I think it is much more convenient. These scissors are no exception. They have a symmetrical design to meet this requirement. The length of these scissors is 5 inches, while the blades are 1.25 inches. They are the ideal dimensions for perfect scissors. These well-made scissors are sharp. They cut accurately and feel great in your hands. Many people do not like cut their beard by themselves because they are afraid of hurting their skin. However, with such sharp blades and skillful trimming, your beard will look great. The good size of finger holes helps you repair your beard like a professional barber. They are large enough for our finger to utilize them without any trouble. You can style your beard as you want. If you have a curved beard, they still work effectively. These outstanding products satisfied me and my family completely. Their material is high quality carbon stainless steel which can last longer than others. If possible, I hope that the scissors’ tips should not pinch and pull my beards instead of cutting them. I felt a little bit painful after using these scissors. This is one of the best facial hair trimmer sets on the market now. This set contains a comb and a beard and moustache scissors which are perfect tools for getting an awesome beard, eyebrows or mustache. These kits are reasonably priced and the right size to get close to the lips and cut the mustache quickly and evenly. They can be the perfect solution for those who never grow the beard before and the stray facial hairs. The comb is small enough to get around all angles of our face. The teeth of this comb are fine to trim the beard and mustache. This is a fantastic set of grooming scissors which are super sharp. Surely, these scissors will not pull your beard, and they have an extra fine point to trim extremely details. They provide the precision for you when cutting. The blade length is approximately 1.75 inches and the plastic comb with 3 inches. These shears are made from Japanese stainless steel. As I mentioned above, Japanese steel is much more delicate than German steel, but it is less durable. Therefore, you have to sharpen it regularly to make sure for the long-term use. Aside with these wonderful features, there is one thing that I wish that it could be improved as soon as possible. The finger holes of the scissors are so small that just fit those who have very small hands. It will be great, if the grip is a little larger. 9. Premium Professional 5” Japanese Steel Razor Edge beard & Mustache scissors with comfort grip for quick & sharp trim of bangs & hair splinters. You may wonder why I did not recommend the electronic trimmers because they are much more convenient. However, I’m not a barber, so if I use electronic trimmers, then I can cut my beard accurately. I love scissors which are manual and under my control. That is the reason why I chose the premium professional beard scissors from the Buzz barber brand. The scissors provide me enough functions that I need to take care of my beard and mustache. The length of these scissors is 5 inches, which is a perfect size for my beard. The convex blades make me feel easy to apply all kinds of cutting techniques from slide cuts to wiping. There is an adjustable screw with the leaf spring plates. This item is very useful to adjust as we want for both tension and speed. The leaf spring is utilized for easy micro adjustments. I hate the sounds made when I cut my hair, and these scissors protect me from those sounds with the bumper silencer. 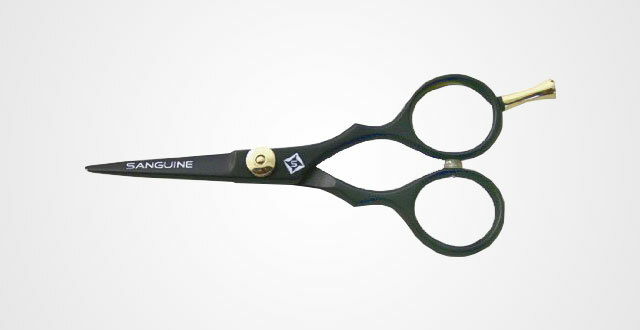 Similarly, these scissors are made of Japanese steel with razor edge technology for precision cut and easy trimming. The finger holes with the given silicon rings fit my fingers to make them more adjustable and comfortable. These scissors are from the Candure brand with the length of 4.5 inches. These scissors have an elegant look and they can keep sharp for a very long time. If you are planning for many beard and mustache cutting, you should not ignore these scissors. These scissors have super sharp blades that can produce smooth cuts. With their right size, you can take the use of them to trim your mustache, beard, nose hair, eyelashes or even eyebrows. The tips of the scissors are rounded, so they are completely safety. I usually use them to cut my damaged and split beards. 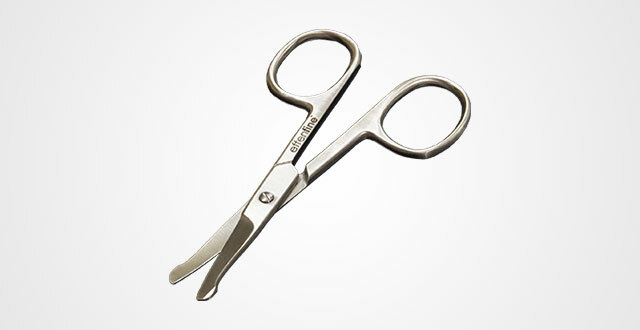 The Candure scissors have a tension crew that makes it adjustable to meet your requirements. They cut your facial hairs with precision. These scissors are well made with the high carbon stainless steel. These scissors are very handy and stylish; however, I think they are a little bit thick and the finger holes are quite small. Except these things, they work fine and are super sharp for good quality cuts. Tweezerman moustache scissors come with a comb. This set is made for the detailed works. If you opt for these scissors, you will get many benefits. This set does a good job with the sharp tips and large finger openings. This set is different from the others scissors because its blades are not only sharp, but also straight for more precise trimming of beard, and mustache easily and safely. While you cut, these scissors will neither pull nor tug at your beards. Besides, you do not need to take time to sharpen these scissors. The Tweezerman moustache scissors do not have finger rest as other scissors, it is comfortable to use frequently. The grip is not too small or big which is enough for manly hands. 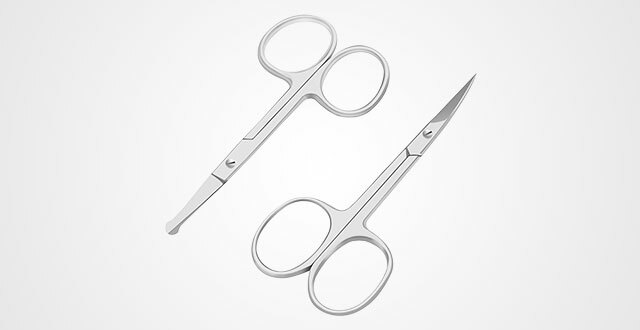 These scissors are 4 inches long and made from durable stainless steel. Honestly, they are not the sharpest ones, but I’m sure that you will want to put anything that sharp up your sensitive skin like nose or ears. Sometimes, you may find difficult to use these scissors because their blades are not adjustable; however, I do believe that their advantages can outweigh this disadvantage. 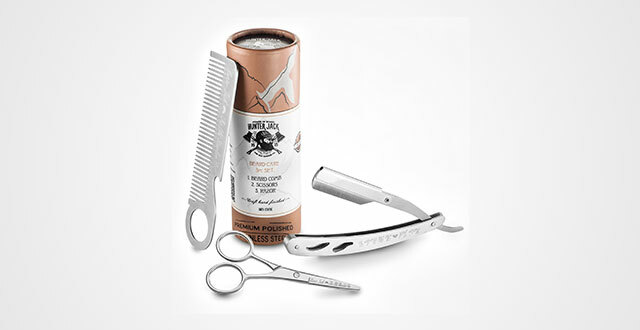 Another set comes from Buzz barber brand is the professional sharp and precise beard scissors. There is a small mustache comb in this set. These tools are suitable for both home and professional use. The 4.5-inch scissors will bring you the comfort and safe to trim your eyebrows, mustache and beards. Bearded men may find easier to round up curve cuts with this perfectly sized scissor. They will no more feel difficult to cut the beards in the areas of the nose and lips. Furthermore, these scissors have an adjustable tension screw. 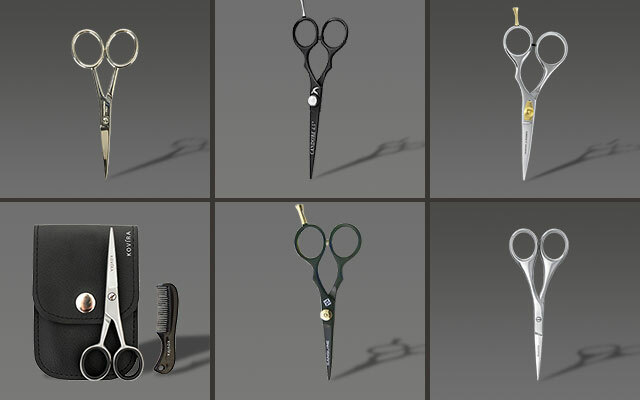 You can increase or reduce the tensions on your scissors to fit your needs. The size of the handles is not too large or too small. Even if you have big hands, you can still control it accurately and easily. These scissors are high carbon stainless steel, so you can get free lifetime. 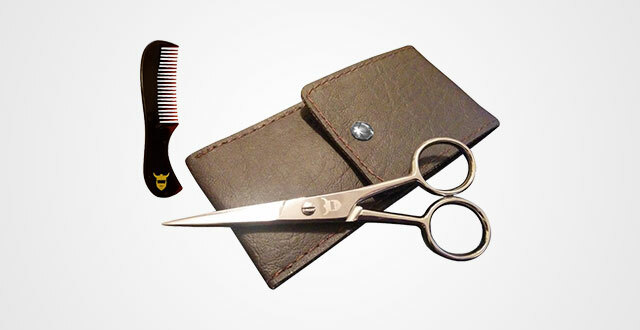 You will have a well-groomed beard by using these very sharp scissors. They help cut our facial hairs with ease. The scissors have an ideal weight, so we can hold them in our hands all day. 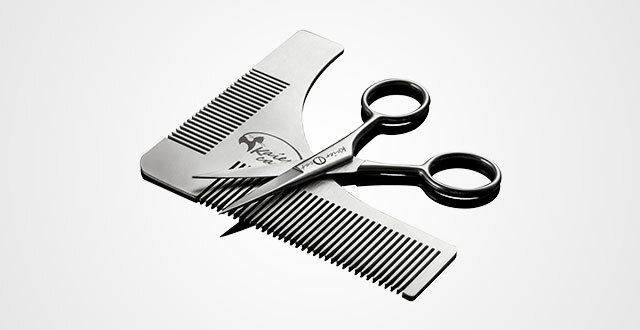 The Buzz barber scissors have good quality, but in some situations, the scissor jaws do not make contact and they are unable to tighten the screw that was glued in one place. The last mustache scissors in this list is the Hunter Jack Beard grooming kit. This set consists of a metal comb, beard scissors, and straight razor. This kit is very useful and it helps to trim and shape both your beard and mustache. Each item of this kit has its own functions. For example, the metal beard comb is used to reduce irritations and itching. It helps to detangle the facial hairs without pulling them out, while the barber razor provides a clean and precise shave. However, I was attracted by its facial hair scissors. The Hunter Jack Beard grooming scissors are designed for nose, beard, and mustache trimming. Their blades are sharp enough to remove the longer facial hairs to leave you a stylish beard. Similar to any mustache scissors, they are made from stainless steel with the dimensions of 4.4 x 2 x 2 inches. Although this set is very beneficial for the buyers, they do not focus on any particular item. Therefore, their functions may be not fully done. For instance, the scissors are sharp, but not curved, so it is very difficult to cut the hairs in the neck line. 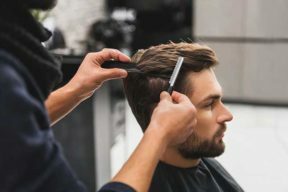 I believe that the combination of this collection and my guide on how to choose the best mustache scissors, you enable to pick up the right pair for your hair. In short, to have the right mustache scissors isn’t an easy stuff, truth to say that. And I understand that out there on the market, there are still countless brands, designs and kinds with different price ranges. BUT, this collection is proudly to give you the most affordable with highest quality and convenience that truly bang for your buck.